Once upon a time, I was a svelte 148 pounds and just a smidge under five nine. I rode horses, threw hay bales around and when time permitted, I lifted weights. I liked lifting weights. In fact, I enjoyed it so much, and was so active that I liked to test how much I could lift once a week. My record week, I bench pressed 198 pounds. That is fifty pounds or about thirty percent more than I weighed. Not too shabby. I am now 20 odd years older, weigh 100 pounds more, and I make my living training dogs. On an active day, I ride my horse, do some weed whacking, shovel some manure and go for a walk. The last time I bench pressed anything, I could comfortably press about 45 pounds; a little less than the difference between my best press and my body weight at the time. Now, just suppose that I wanted to press 198 pounds again. What would I have to do? More or less what I looked like when I was in my twenties and regularly lifting weights. I worked out five times a week, and I worked out in a very methodical way. This allowed me to be very successful. Imagine for a moment that I decided to approach weight lifting the way my clients approach behaviour modification for their dogs. Using the Joe Q Client model, what I would do would be to load up the bar with 198 pounds, lie down on the bench and get busy trying to press that weight off my chest. And I can tell you that the weight is going to go precisely….nowhere. Never the less, I am determined, so using this model, I will try again tomorrow. And the next day. And the day after that. I will try every day, until I hurt myself. And then I will stop. This is what happens when your dog who used to play nicely with other dogs but now doesn’t, and you take him to the dog park and hope for the best. Your dog does his best, and when he is frightened or overwhelmed, he behaves in the only way he knows how; he is pro-actively aggressive. Or he bolts and won’t come when called. Or he hides between your legs. And the more that you take this dog to the park, the less successful you will be, until one day, he gets into so much of a scuffle that you stop trying altogether. And then you stop. If I really want to get back to weight lifting, and be successful at it, I am going to have to do a few things. First, I have a few injuries that I hadn’t accumulated when I was in my twenties. It would probably be a good idea to talk to a doctor about what I can do safely now. And then to a personal trainer for more information. My doctor might send me to do a bit of physio to prepare for weight lifting, because lets face it, a forty something, sedentary woman who is a hundred pounds overweight is not likely going to be as able to cope with injuries and challenges the way that a twenty something fit and active person could. In the same way, if you are living with a dog with a serious behaviour problem, working with someone who is qualified in the field of dog behaviour is a good first step. An adult dog with a serious problem is not likely going have the resiliency and bounce back that a young puppy would. You can get very helpful advice about how to approach the problem if you see a professional who has the experience to identify what is going on with your dog and who can make recommendations about what to do. The next thing I am going to have to do if I want to get back into shape is to find the RIGHT gym to work out with. When I was in my twenties, I worked out in the open gym at the University of Guelph, and got a lot of help figuring things out from the football players. I am pretty sure than the football players are not going to be my go to guys this time round. Firstly, they are probably less interested in a forty something married woman than they were in a twenty something single woman. And secondly, they probably don’t have the experience working with someone coming back, instead of someone who is already pretty fit. This is also true of finding the right behaviour program to work in with your dog. You aren’t likely going to get the results you want if you are working with the person at the dog park who thinks she knows something about dog training but doesn’t do any continuing education, and doesn’t do any research and doesn’t compete in dog training competitions and who really just happens to like dogs and to have one fairly well behaved dog she lives with. Yes, that is where we all started in this game, but that is not going to be much help with the serious behaviour problem or training challenge. You want to work with someone who has a program of some sort or another to help you out. At Dogs in the Park for instance we have an integrated program that includes behaviour privates, a behaviour group classical conditioning class, a behaviour obedience class, a regular obedience class, puppy classes and three different dog walks. When we were smaller, we focused exclusively on behaviour and only offered the classical conditioning class and the behavioural obedience class, the walks and the privates. As we have grown we can offer more options, but even when we were smaller, our goal was the same; to meet the needs of our clients. Finally, the work that did to get to my record bench press was the result of months of increasing difficulty. I started out pressing about 90 lbs. I worked out at 90 for a while and then added five pounds. Then I worked out at 95 lbs for a while and added five more lbs. Week by week and month by month I increased the difficulty of what I was doing. All the way along I had support. I ate well. I drank lots of water. I did cross training. And I didn’t go faster than my body was prepared to go. If I had increased my weights by 20 lbs at a time instead of by five, I would have sustained an injury. By increasing my weights slowly and by cross training in other disciplines, I was able to stay injury free for all of the time I trained with weights. I see so many of my clients trying to rush through the foundations. It doesn’t matter if you are trying to change a problem behaviour or if you are trying to bring a puppy up right, if you are trying to prepare a dog for assisting a disabled person or if you are thinking about competing in agility or obedience, rushing through the foundational work and taking too many steps all at once leads to problems. There is no advantage to skipping ahead. Getting to the goal faster in weight training risks injuries, and getting to the faster in training risks inconsistent behaviour. From this, I get the title of this blog “travelling at the speed of dog”. Some dogs learn tasks quickly and easily. Some dogs experience difficulty with tasks. Some dogs learn best in the morning. Some don’t. When I was in my twenties, it was a fairly smooth steady program of progress in weight lifting. I don’t expect that would be the case anymore. Regardless of your goals with your dog, travelling at the speed that your dog is able to learn means that you build a strong foundation and you will be successful in the long run. When my clients are just starting out in dog training, they want to do everything all at once. When they follow the program and work in a step wise manner, then they can be successful at each step and build a strong repertoire of behaviours. 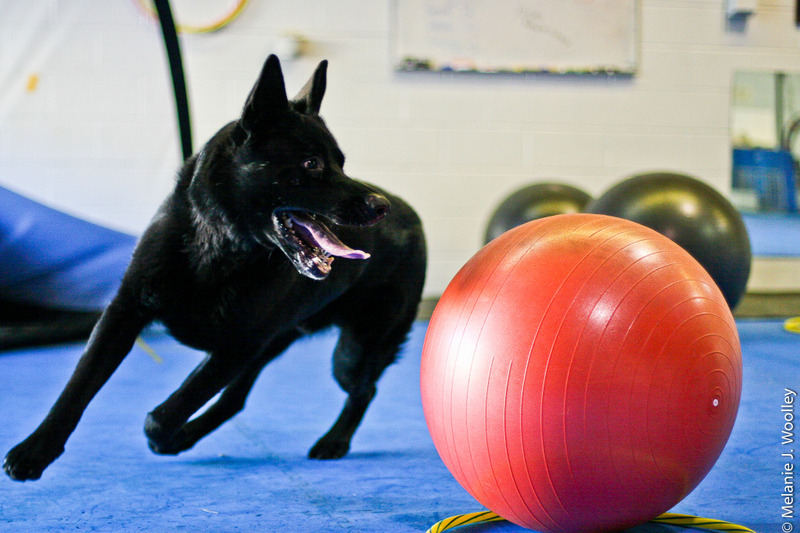 That strong foundation and strong repertoire means that you and your dog can do more together.